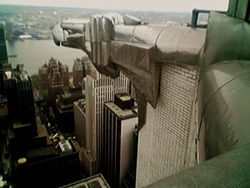 The Chrysler building address is 405 Lexington Ave, New York. It was started in 1926 by William van Alen and was finished in 1930. The cost was around fifteen million dollars. It is made up of steel framing, metal cladding, masonry, steel, stone, and concrete. The out side was manly made of brick; at the top is stainless steel and glass at the triangular shape. The height was 77 stories tall or 1,046 feet! The architecture type is Art Deco. Art Deco was mostly in use through 1925 and 1940, characterized by geometric designs with bold colors and the use of plastic and glass. Walter P. Chrysler (was the owner) never paid architect William Van Alen for his work on the Chrysler Building. Cool fact: 20,961 tons of structural steel; 391,881 rivets; 3,826,000 bricks; 10,000 light bulbs; and 3,862 windows are in the Chrysler Building. The PBS web site says: “In the summer of 1929, a "race for the sky" broke out on the island of Manhattan. Automobile tycoon Walter Chrysler battled Wall Street powerhouse Bank of Manhattan Trust Company for the title of world's tallest building in what many historians consider to be the most intense race in skyscraper history.” In the spring of 1930, when it appeared that the bank was going to win to be the tallest building in the world when a small crew constructed a needle thin spire that was hidden in the Chrysler building through the top of the crown to claim the title of world's tallest at 1,046 feet until the Empire state building came along in 1931. On July 9th 2008 the Chrysler building was sold to Abu Dhabi Fund. This would be probably my second favorite one because of the interesting stories and the height of the Chrysler building!